Back pain affects one in four Australians. It’s so common, nearly all of us (about 85%) will have at least one episode at some stage of our lives. It’s one of the most common reasons to visit a GP and the main health condition forcing older Australians to retire prematurely from the workforce. Treatment costs for back pain in Australia total almost A$5 billion every year. A great proportion of this is spent on spinal surgical procedures. Recently, Choosing Wisely, the campaign to educate medical professionals and the public about tests, treatments and procedures that have little benefit, or lead to harm, added spinal fusion for lower back pain to its list. This is because, despite rates of the procedure being on the rise, current evidence doesn’t support spinal fusion for back pain. Randomised trials (regarded as studies providing the highest-quality evidence) suggest spinal fusion has little advantage over a well-structured rehabilitation program, or psychological interventions, for back pain. Spinal surgery is most commonly performed to remove pressure on nerves that causes pain and other nerve symptoms in the legs. This surgery is called decompression. The next most common procedure is spinal fusion, where two or more vertebrae are joined together (using such methods as transplanted bone from the patient, a donor or artificial bone substitutes) to stop them moving on each other and make one solid bone. Spinal fusion may be performed for fractures, dislocations and tumours, and is commonly performed in conjunction with decompression. For back pain, it’s performed when the origin of the pain is thought to be related to abnormal or painful movement between the vertebrae (from degenerative joints and discs, for example). Rates of spinal fusions have been rising and continue to increase, outstripping other surgical procedures for back pain. 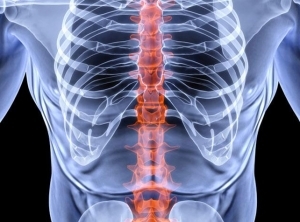 In the United States, rates of spinal fusion more than doubled from 2000 to 2009. In Australia, rates increased by 167% in the private sector between 1997 and 2006, despite almost no increase in the public sector. Spinal fusion rates differ significantly between regions of Australia, with the highest being in Tasmania and the lowest in South Australia: a seven-fold variation. Significant variations are also seen between countries. For instance, spinal fusion rates in the United States are eight times those in the United Kingdom. The greatest increase in the use of spinal fusion has been in older Australians, often in conjunction with decompression surgery for spinal stenosis – a condition that causes narrowing of the spinal canal (the cavity that runs through the spinal cord). Differences in clinical training, professional opinion, and local practices are likely to play a role in such variations. There is little high-quality evidence to support the use of spinal fusion for most back-related conditions, including spinal stenosis. And there is disagreement between surgeons on when spinal fusion surgery should be performed, not only for back pain but also for more acute conditions such as tumours and spine fractures. There have also been no studies comparing spinal fusion to a placebo procedure. Most research to date compares one fusion technique to another technique or to a form of non-surgical treatment, so we still don’t know whether spine fusion is effective against placebo. We also know that spine fusion surgery is expensive and associated with more complications than decompression surgery. And the surgery often fails. Around one in five patients who undergo spine fusion will have revision surgery within ten years. Research also shows most patients having spine fusion surgery under workers’ compensation won’t return to the usual job, will still be having physiotherapy and be on opioid medication two years after surgery. So why are rates going up? There are several factors, including an ageing population, that may contribute to the rapid increase in spinal fusion despite the lack of evidence supporting its use. Financial incentives might also explain the differences in rates between private and public sectors in Australia and between the United Kingdom and the United States. We don’t have high-quality evidence on the benefits and harms of spinal fusion. This means there is uncertainty, which allows practitioners to continue doing the procedures they were trained to do unchallenged. This then leads to overtreatment, particularly where reimbursement rates are high, such as in the workers’ compensation setting. Uncertainty about the appropriateness of spine fusion results in practice variation, wastes scarce health care resources and leads to worse patient outcomes. We need better research in this area. This means research efforts should shift from studies looking at different ways of performing the surgery and focus on investigating whether or not it works better than non-operative treatments or a placebo, and, if so, whether the benefits outweigh the harms.